"The King of Fighters 2000 is a 2000 competitive fighting game produced by SNK for the Neo Geo arcade and home platforms. 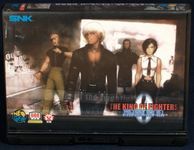 It is the seventh installment in The King of Fighters series for the Neo Geo, as well as the final one produced by SNK before the company became financially bankrupted. The game was ported to the Sega Dreamcast (in Japan only) and the PlayStation 2 in 2001. The stand-alone PlayStation 2 version of the game was released in North America in a two-in-one bundle with its immediate sequel, The King of Fighters 2001. The Neo-Geo and Dreamcast versions of the game were also included in The King of Fighters NESTS Hen, a compilation released for the PlayStation 2 in Japan. The gameplay is based on The King of Fighters '99 and expands on the "Striker Match" format introduced in that game. The game now has an Active Striker System, which allows the player to summon the Striker member during any situation, whether the player is attacking or being attacked by the opponent, allowing the player to use their strikers in combos. Additionally, the player can now replenish Strike Bombs by taunting the opponent (at the expense of one filled stock of the Power Gauge). The player now has two choices after selecting the Striker member of the team. The player can choose to use the regular character or an alternate character officially known as Another Striker, a character used exclusively for striker attacks. These alternate Strikers are characters from previous KOF games and other SNK franchises (such as Fio Germi from Metal Slug 2 and Duke Edwards from Burning Fight), as well as alternate versions of characters in the game such as Iori and Robert. There's also another set of alternate Striker characters known as Maniac Strikers, which are selected in the arcade version by inputting a specific codes for each. The console versions includes additional Maniac Strikers by completing a certain number of matches in the "Party Mode"." Source: Wikipedia, "The_King_of_Fighters_2000," available under the CC-BY-SA License.